According to various sources, YouTube is the 2nd biggest search engine on the Internet with more than 3 billion searches per month. 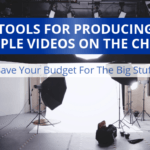 Obviously, there’s a big opportunity in placing and optimizing videos for YouTube. 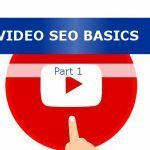 That’s a lot of search traffic, and ranking a video for a popular search is sure to drive revenue. However, YouTube is also a decent place to build quality, relevant links to your website. 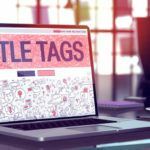 With the right approach YouTube can help your ecommerce site rank higher on Google.com (and Bing.com too). Getting the channel link is easy. Just create a channel/profile, fill out as much information as you can, and pat yourself on the back. Give yourself bonus points if you take the time to link to other social media profiles, and upload a branded YouTube channel cover. Check out our YouTube channel (and click on the About tab) to see how we filled out the social media links. Here’s a screenshot of the links we have on our YouTube channel. Linking social media profiles together is always a good idea. Upload a video to YouTube. Videos should be useful or interesting, should be titled to reflect their content, should be branded so consumers know who they’re watching, and should be authentic (overproduced videos don’t work very well). Place a link prominently in the video description. The recommended best practice is to place the actual link in the very first line of text when you upload the video. This is the best place to put a link on all of YouTube because the link is very likely to get clicked on. 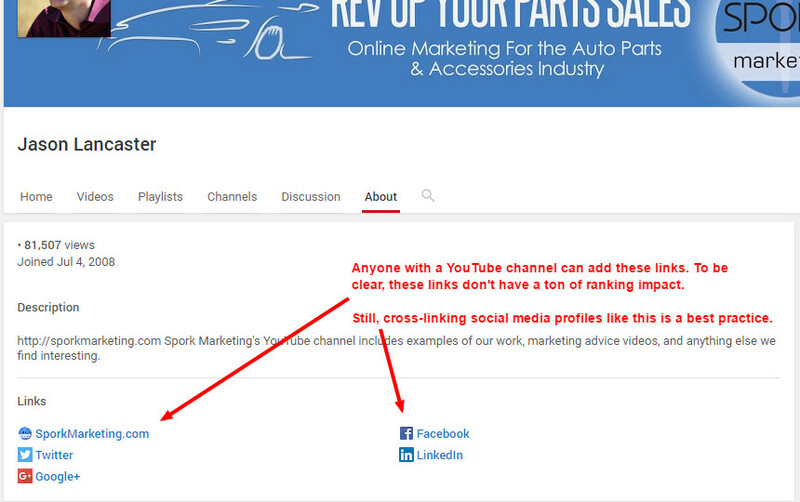 A link in a YouTube video description can drive a lot of targeted traffic. 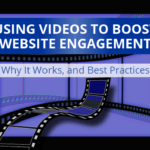 If only a small percentage of the people who watched this video clicked on the link – say 3% – that works out to more than 30,000 website visitors. If the percentage is higher, the traffic could be significant. The link in the video can point to a related page on the site. Relevance is a key factor when Google (and Bing) evaluate link quality. 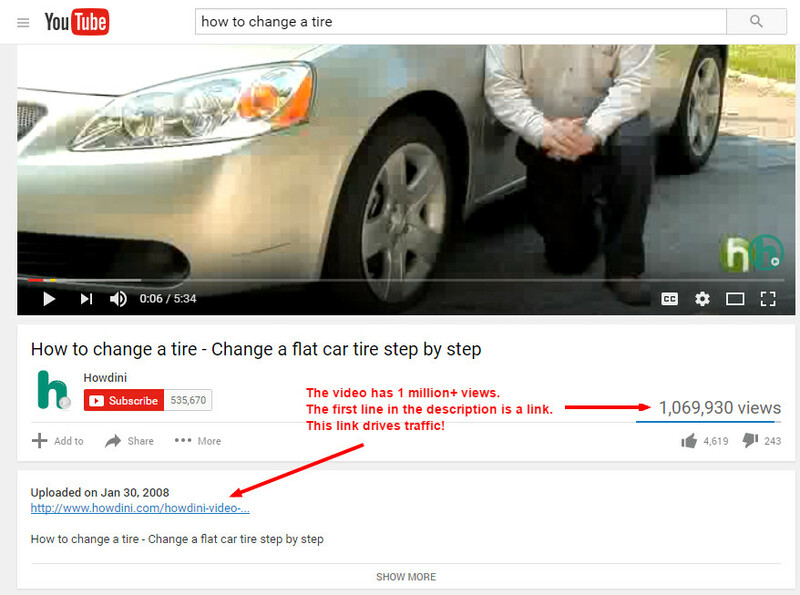 Google is indexing this link because it’s in the description of a top video about tire changing on YouTube. That means the link is likely viewed as high quality. NOTE: In this specific example (see the video page here), the link in the video description is sub-optimal. It’s basically pointing to a clone of the YouTube page, which doesn’t offer the user a lot of value. However, if this link pointed to a quality article about changing a tire with additional details, the relevance would be strong. Great links occur where quality meets relevance. If a quality video links to a related page, the link in the description has ranking value. 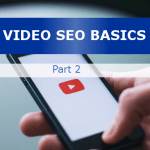 But setting aside the nofollow question, most SEO experts agree: If a popular YouTube video relevant to your business where to link to your site in the video description, it can’t be bad. What About Loading Up The Description With Links? Technically, YouTube doesn’t limit the number of links you can include in your description. You can, therefore, write a very long description that includes dozens or hundreds of links. While we don’t have any hard data on the efficacy of this practice, we do not recommend including more than a handful of links (five or six links seems to be the very upper limit). There are also concerns about dilution – if your description has only one link, that’s a strong signal. If it has five links – or fifty – that’s not nearly as strong of a signal. YouTube is a great place to build links, provided you have good videos to upload. Uploading garbage videos is a sure-fire formula for failure because no one is going to watch them. If no one watches a YouTube video, Google and Bing aren’t going to assign any importance to whatever link(s) are included in the video’s description. Therefore, the best practice is to upload good quality videos, optimize them, and then make sure to place a relevant link in the description.